Cpl. 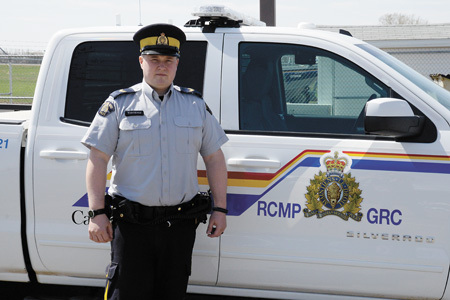 Brian Weisbrod has been enjoying his transition to rural policing in his new post at the Taber/Vauxhall RCMP detachment. An 11-year veteran on the force, Weisbrod has been at the local detachment since the end of January. “It is something I’ve always wanted to do since I was a little kid. I’ve always liked the options. You can go all over the place, there are different fields you can get into and you are not always working inside and you’re not always working outside,” said Weisbrod of his love of law enforcement. Having to brave one of the harshest southern Alberta winters in recent memory, Weisbrod has been settling into the community nicely with his wife Tiffany. “The adjustment has been good. The community is super nice and the people I have talked to and dealt with, they are all very friendly. It has that small-town feel which I like,” said Weisbrod. Camping and fishing are two big things Brian and his wife Tiffany like to do in their spare time and the southern Alberta region certainly fits that bill with all the areas that are nearby. “Being closer to the mountains and being closer to the border is nice,” said Weisbrod. Weisbrod has already served on a wide range of detachments, coming from Lloydminster and a small three-man detachment from Manitoba prior to that. “Going from city policing back to rural policing, I have to learn a whole bunch of new things again. Things I took for granted in the city. The public servants would do some of the administrative stuff for us, so I’m re-learning that,” said Weisbrod. To be an effective officer, Weisbrod noted for him he walks that fine line between enforcement and education. Weisbrod was a watch commander in his last detachment and was in charge of six members, plus a plain-clothes member. In Taber/Vauxhall RCMP, he is in charge of four members. In his over-a-decade of policing experience, Cpl. Weisbrod has already seen a break-neck speed of innovation and evolution to the job. As he continues to serve the community, Cpl. Weisbrod stresses the Taber/Vauxhall RCMP detachment is trying to be as proactive as possible in he area and as approachable as possible.